Mt. Laguna is 6,000 feet and a little over an hour drive from the Pacific Ocean. Compared to urban, coastal California you are in a different world even though you are so close. By the pile of rocks in the meadow. You can see the stars at night. The Milky Way looks like dust or clouds though it’s actually a stellar blanket seen in the dark night sky. Is that why they call it the Milky Way? I grew up with a dark night sky but now it’s a brilliant oddity. The birds in the mountains are different. Red-winged blackbirds sing their colorful songs and stellar jays look like black hipsters wearing flat tops and a blue suit. 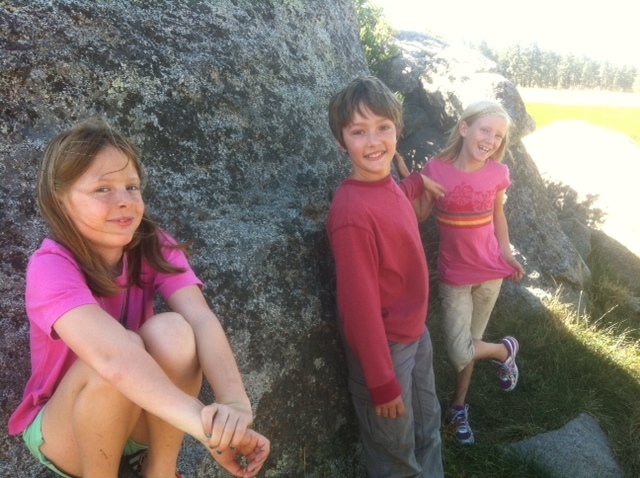 A meadow in the middle of the pine forest has a pile of rocks, and my kids like to go there to jump from one to another. It’s been raining here, and there are thousands of tiny frogs they capture and release. In a tent with three kids I lie, waiting for sleep to come as others in the campground continue their parties, talking, laughing and listening to music. Slowly the sound turns to nothing but the shrill cry of bugs in the trees. This entry was posted on August 19, 2012 at 9:18 pm and is filed under Uncategorized. You can subscribe via RSS 2.0 feed to this post's comments. You can comment below, or link to this permanent URL from your own site.